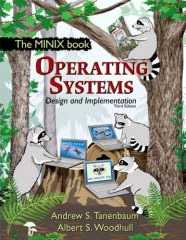 The main documentation for MINIX 3 is the book Operating Systems: Design and Implementation 3/e by Andrew S. Tanenbaum and Albert S. Woodhull, Prentice Hall, 2006. The image at the right is a link to the book at amazon.com. This book discusses operating systems in general, and MINIX 3 in particular. A large piece of the source code is listed in Appendix B and is described in detail in the text. The listing is available in various formats. The files, functions, and #defines are indexed. The version of the code listed in the appendix is available as a tar file. Although the book is still probably the best place to start if you really want to learn all the details of the code, it describes MINIX 3.1.0, which is quite old now, rather than the current release. A new edition of the book may come out one day, but do not hold your breath just yet. We are trying to get the users more involved in the project and to improve the state of the documentation. For this reason, we have set up a wiki, like the Wikipedia, except only about MINIX 3. It is located at http://wiki.minix3.org. The intention is to move all the documentation there. Anyone can edit it. You can, too!